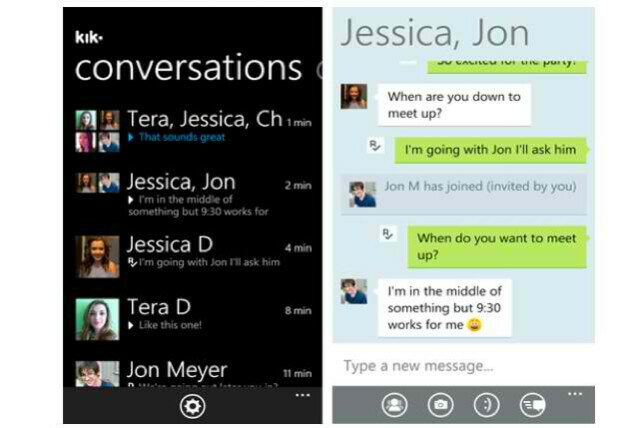 With more than 4 million plus Kik users out there, it’s only going to balloon even more now that the popular messaging app is coming to Windows Phone 7. Nowadays, it seems that Microsoft’s mobile platform is starting to raise some eyebrows with developers all around, which is evident by Amazon’s recent decision to release their grocery shopping app with the platform before anything else. Already, we’ve seen Kik storm up some things over on the BlackBerry side, but as we all know by now, RIM kicked out the popular messaging app from the App World. Regardless, now that it’s available to Windows Phone 7, it should be able to entice handset owners to start using their popular service – thus increasing their user base. Naturally, it’s nice to see that Kik is a cross platform messaging service that allows people to keep in contact with one another – albeit, BlackBerry users are out of the mix right now. And again, it once again shows that Microsoft’s platform is indeed rising up the ranks amongst developers. If you ever used BBM for BlackBerry its almost the and accept it works with Android and now WP7. Its a good replacement for anyone that doesn't want to run up txt messages as it sends IM through data. Its simple but with alot of features like group conversations and the ability to see if your message was sent, delivered, and read! Its really nice once setup. Very cool. i use Whatsapp, but i hear Kik is quicker? I also use VEXX-SMS for sending SMS's to those phones which are not smartphones, when ppl are NOT on BBM, whatsapp, or Kik. , VEXX is able to reach more peeps coz it works on more phones compared to these other apps! i like VEXX, offers more than those IM apps.